Abraham Lincoln was just a boy when he learned that his mother's untimely death was actually the work of a vampire. From then on, he vowed to devote his intelligence, strength--and skill with an ax--to the elimination of the soulless creatures. It was a path of vengeance that would lead him all the way to the White House. No one ever knew about Lincoln's valiant struggle against the undead... until author Seth Grahame-Smith laid eyes on Abe's secret journal--the first living person to do so in over 140 years. Putting a supernatural spin on revisionist history, Seth has reconstructed Lincoln's true life story--while revealing the role vampires played in the birth, growth and near-death of our nation. 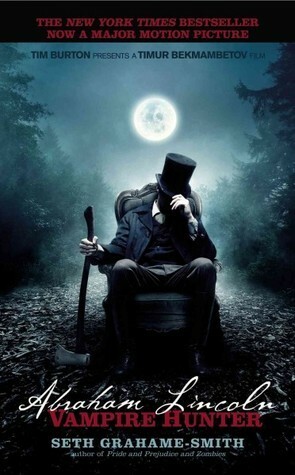 I picked up Abraham Lincoln: Vampire Hunter by Seth Grahame-Smith after seeing a trailer for the movie. I adore Abe and have always been fascinated by him. I have read several books based on his life, visited the cabin he was born in and gazed into his eyes at the national monument. I also happen to love vampires and decided I wanted to see the movie. I have a little personal rule that I read the book first; since it is always better. I find doing it in reverse spoils it for me. I found Seth’s take on Abe and American history to be highly entertaining. I love the format he used and the way in which he incorporated actual photos to support his story. The novel starts out introducing us to the writer of this novel, he is an aspiring author who finds life got in the way of his dream. One day Henry, a young man, who he has previously befriended, comes in to his store with a package and a sealed envelope. He tells him to read the letter first. The young man is anxious to read it but waits until the close of business. He reads the letter and it states the contents are on loan to him, if he agrees to write the story contained within. It further instructs him that he cannot share its contents with anyone. What he discovers are journals penned by Abraham Lincoln. They detail his life and his role as a vampire hunter. The aspiring author thinks it’s all a joke; till he hears a noise and turns around to see Henry with his fangs exposed. The tale that unfolds takes us on a journey from Abe's humble begins to his life in the White House. It is filled with history and unique twists; as key events depict vampire involvement. Seth kept me completely enthralled as we traveling through Abe’s life. The characters both famous and common in this novel were uniquely characterized by the author and I grew quite fond of them. I think the fact that he stayed true to these men and women’s personalities (as depicted through history) gave his twists a believability that might not have otherwise rung true. His introduction of Henry and how he influenced Abe was fascinating. I like how he separated vampires into two groups those who wanted to live among us and those who wanted to rule us. The way he blended slavery into this issue was horrifying and believable. Slavery in itself is deplorable and he found a way to make it darker. I still get goose bumps thinking about some of the scenes. I really enjoyed the slight alterations to historical events. The tale felt real and the fact that the author introduced himself into the tale as the writer gave the story an eerie authenticity. It was at times dark but I would have liked a little more gore! Having said that, I consumed this in a few sittings and was captivated both by the tale and the author’s writing style. I liked how he broke out sections to include journal entries. I felt he adequately depicted Abe’s voice in these entries. He incorporated some of Lincoln’s actual speeches and authentic journal passages to make it all feel surreal. The ending was unique but I am not one hundred percent sure it was the right one. I highly recommend Abraham Lincoln: Vampire Hunter to fans of historical fiction who want a paranormal twist! This was a fun, entertaining read and I cannot wait to see the movie. Grahame-Smith wrote Pride and Prejudice and Zombies and I have added it to my list. I was hesitant to read it, but after reading this novel, I feel confident the author will do Jane proud. I gave this novel 4 coffee cups out of 5. Love the new look for the blog Kimba! When did you change it? I go MIA for two weeks and it's like everyone's blogs have changed! Sounds like an awesome book. How come you always find and review pretty epic-looking books ? Glad you liked it, Kimba. I saw the trailer for the movie and it looks interesting. Thank you for another one of your great reviews! I will go pick this up this weekend (hmm, Kindle or paper?). And now that I hear that the guy that directed Wanted did this movie, I can't stand the wait for the movie!!! UGH!! I have yet to read this. Going to the book store and grabbing it today. A rainy day here, what better thing to do than browse shelves:) Will be seeing the movie also. Good cast and the trailers are promising. Sounds awesome! I really want to see the movie but I hadn't decided if I was going to read the book yet! I think I might!!! I've been contemplating reading this one as my fiance really is keen to see the movie. Great review! Great review Kim, I am looking forward to the movie and I am adding this one to my reading list. okay I gotta read this! I also like to read the book before the movie! The trailers for the movie look awesome, so I gotta hurry and read before it comes out! Hell yeah, I CAN'T wait to read this and watch the movie! At first I was excited about this movie. Until I saw the trailers. I wasn't impressed. I tend to like the books better, so perhaps I will try it since you gave it 4 cups. Awesome review. I'm so glad this one worked for you. I do like to read the books before the film as much as I can, but I don't think I can in this case. Oh well, I'm excited for the movie and I think I'd like the book whenever I get to it too. I have had my eye on this forever. I am glad someone I know and trust reviwed it! Thanks Kimba! I agree the movie looks great. I am definitely going to read this. I love historical books and add in a paranormal twist, hey even better. Glad it ks not super gory! I hope you will review the movie! too. I first noticed this book getting a lot of 'chatter' during the last Bout-of-Books Read-a-thon. I'd seen it on bookshelves and loved the title, but didn't consider reading it until then. When I started looking into it I found out it was going to be a movie.. (I know, I live under a rock - with my nose in a book.) Anyway, when I saw it at Walmart, cheap, I couldn't resist. It's now 'officially' on my TBR list. ;) Great review! I read this when it first came out because my boyfriend bought it...the fact that he bought a book was surprising enough but he insisted that it was fantastic so I HAD to read it. I completely agree with you on all points, the author did an awesome job of blending fantasy and history together. I plan on watching the movie as well so I may re-read it if I get the chance. Great review! I first heard about this book a while ago but wasn't sure about it. However, after seeing the movie trailer I was a lot more interested. I'm one of those people who must read the book before seeing the movie so I planned on picking this one up soon. Now though after reading your review, I'm a lot more excited to start reading it. It's good to hear that the twists made in the historical moments still were realistic.